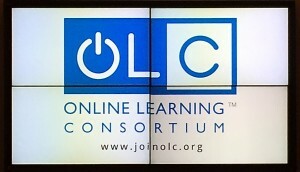 I attended the Online Learning Consortium (OLC) annual conference last week, and the event's theme was relevant to everyone involved in online education right now – Shaping the Future of Online Learning. There was a lot to explore through keynote presentations, general sessions and posters (now called discovery sessions), as well as virtual attendance and social networking feeds. More than 1,700 on-site participants, representing all 50 states, Washington, DC and 26 countries, discussed leading edtech practices, new innovations and ideas about what's to come. Opening keynote speaker Goldie Blumenstyk, journalist with The Chronicle of Higher Education, addressed the myths and realities of today's crisis in higher education. She shared that "higher ed has never been more important, and has never been more under stress." Academic and Career Goals: meeting the needs of students who will enter a workplace that expects both the skills and knowledge provided through a liberal arts education and preparation to perform job-related tasks. Alternative Credentials: beyond academic curricula, badges and new extended transcripts capture a student's broader achievements and skills. Open Education: described by Blumenstyk as a "sleeping giant," integration of shared resources and materials, often at no cost to the user, has yet to reach its potential. Big Data: faced with a never ending variety of new tools processes and products, Blumenstyk advises us to ask questions related to research – is there evidence that these tools work, and for whom and in what context? It may be time to step back a bit from the educational technology deluge to re/assess. We need to confirm our destination and check the map. Where are we going in online higher education and how will we get there? Phil Hill and Michael Feldstein, from MindWires Consulting, changed the overall tone of the event with their keynote session on the conference's second day – "The Move to Student-Centered Active Learning Will Not Be Easy" [Slides]. Many of us use the term student-centered to describe a general approach to course or curriculum design, or to our own teaching. Some colleges and universities even use the term in marketing initiatives with prospective students, but what does it mean? Self-regulated learning: Essex County College students and faculty are piloting personalized learning software in a remedial math class [Video].Â In a face-to-face computer lab, instructors move around the room, coaching students on a variety of concepts based on their individual needs and progress toward learning goals. "If you don't get it, it's your fault," one student states after listing all of the assistance available (i.e., instructors, teaching assistants, peers, software feedback screens, online materials). Game-based learning: An Arizona State University chemistry professor developed a game approach to engage students in problem solving tasks in an online lab course for non-science majors [Video]. Instructors monitor discussion boards, serving as a resource to help students work through challenges when they get stuck. One student said that this was his favorite course, because of the interaction and support. Student-centered learning means new demands on faculty, which include more attention to data collection, analysis, interpretation and decision-making. The role of instructors is evolving as higher education moves beyond creating an online version of a traditional classroom. College administrators and academic departments increasingly support mainstream (i.e., traditional) instructors facing changes with technology requirements that they may not be ready for – the adoption curve is compressed with little time for transition. Instructors are also less in control of the classroom as students independently work toward established learning goals, meaning that they need to be flexible enough to cover many different topics at different levels in any given class period or teaching day. In almost every session I attended at OLC, especially those in which a new application was introduced, the first question from the audience was, "Is it accessible?" In this context, accessibility has to do with providing an equivalent learning experience for all online students. The Americans with Disabilities Act addresses the need to make information technology and electronic content available to all consumers. Challenges exist in higher education as students with disabilities enroll in online courses. Modifications can include providing transcripts of audio recordings, captioned video presentations, text-based descriptions of images and programming that allows for alternate on-screen navigation (e.g., menu bars, tables). As you might imagine, complex tools can require a lot of modification. And while some new applications build accessibility functions into their systems, this is not always the case. At the institutional level there are funding issues. Transcription, for example, is expensive and is often billed by the minute. Some schools have a strategy for the content they develop. An example provided in one session, was that any information available on a public site must be accessible, while information that is private (e.g., for use by students enrolled in a class), is modified as needed. So how did presenters answer the accessibility question? Usually the answer was, "No." Although there was an overall acknowledgment that we need to be working on it, even if progress is slow. Piazza: a wiki-style Q&A tool that integrates with many learning management systems; alternative to the standard discussion forum or other online community sites. Going Online: a book published in 2012 by a group of college and high school educators; cited in a presentation about the continued use of threaded discussion boards – tips for using conversation protocols to prevent these forums from becoming busy work. TOPcast: the Teaching Online Podcast from the Center for Distributed Learning at the University of Central Florida; watch for the session recorded during OLC, which makes some predictions for the next 5 years in online education. FlipGrid: connect with students and colleagues in topical "grids" that allow members to send video responses to text- or video-based questions. Product Hunt: looking for a scheduling solution or social media add on? Or maybe you just want to explore the newest tech tools; search for products online by keyword, and try the mobile app, too. QuietTube: use this browser extension to watch videos from YouTube, Viddler and Vimeo without the distraction of comments and other on-screen clutter. Seelio: an online portfolio system that encourages students to not only demonstrate their work-related skills, but also reflect on career development throughout their academic coursework. The conference is now over, but the conversations continue thanks to the collaborative atmosphere fostered by The Online Learning Consortium and all of the conference sponsors, organizers, presenters, vendors and attendees. 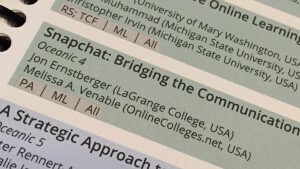 Follow @OLCToday on Twitter and review the stream of activity via the conference hashtag [#OLC15], which is still going strong with shared reflections on the event. The History of Online Education infographic. Feel free to post this image on your site or blog! Please copy and paste the HTML code below.